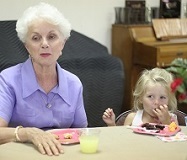 First Presbyterian Church has served the community of Richmond, Kentucky for almost 200 years. Sixteen charter members met on Friday, July 6, 1827, to establish the very first church in Richmond. The following year (1828), the congregation built the first house of worship in Richmond on the site where the church still stands today. 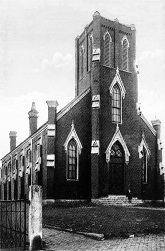 The first church was a large, symmetrical, two-story brick building with a steeple belfry capped by a spire. Two entrance doors faced Main Street. Slaves and free African Americans entered by the right-side door and sat in the back pews. Others entered by the left-side door and sat closer to the front. By the 1850s, the need for a new building was evident. The wall behind the pulpit was giving way to such an extent that parishioners were afraid to attend church when a hard wind blew. In 1858, the first building was torn down and a second erected on the same site. 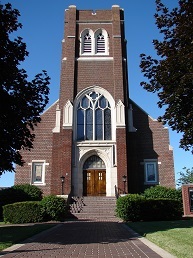 The new church, an ornate Gothic-style brick building trimmed with carved stone, invited its worshippers to aspire toward heaven as they gazed upon its bell tower which reached high into the sky. Seldon-Breck Construction of Saint Louis, Missouri built the third and current church in 1921. Nevin architects of Louisville, Kentucky designed the Gothic-style building, which is larger but less ornate than the structure it replaced. First Presbyterian Church of Richmond, Kentucky has played an important role in the development of the Richmond community. It was the home church from which a Presbyterian college known as Central University (now Eastern Kentucky University) was established in 1874. Three U.S. Congressmen (one of whom was Speaker of the House); one U.S. Senator; and a two-term Governor of Kentucky called First Presbyterian their home church. 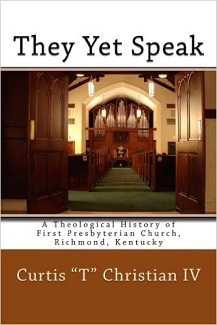 If you are interested in reading more about the history of First Presbyterian Church, we invite you to prurchase a copy of They Yet Speak: A Theological History of First Presbyterian Church, Richmond, Kentucky. This book is now available in Paperback and Kindle Version through Amazon.com.